GALS is a free summer science program for high school (9th to 12 grade) female students to learn science hands-on while backpacking through the wilderness. GALS was created in 2016 by four female PhD students in Biology and Ecology programs at Duke University to increase opportunities for students who identify as female or gender nonconforming, students of color, students from low socioeconomic backgrounds, and other groups underrepresented in fields of STEM (Science, Technology, Engineering, and Math). GALS strives to cultivate a passion for environmental science and stewardship, develop leadership abilities, enhance critical thinking skills, and promote teamwork. This program provides female students with the unique opportunity to gain hands-on experience in science and experiential education while immersed in a supportive community of peers. Graduate students from NMSU's Fish, Wildlife and Conservation Ecology department are bringing the program here to New Mexico. 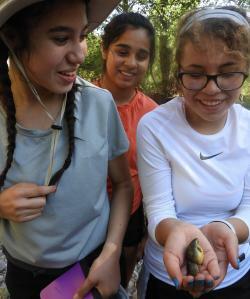 Each Summer, GALS of southern NM and west TX will run a one-week outdoor science experience for local girls from grades 9-12. During this one-week experience, students will learn ecology, wildlife science, earth science, and other topics by exploring your surroundings with local scientists. This mentally, physically, and academically challenging trip rewards you with a deep understanding of your natural surroundings and your own leadership strengths. Learn the real-world skills needed to become a natural scientist. Learn more about the 2019 GALS program here. Students will plan and implement their own scientific studies and will gain outdoor skills. Academic Programs (aces.nmsu.edu/academics), Agricultural Experiment Station (aces.nmsu.edu/aes), and Cooperative Extension Service (extension.nmsu.edu) all sponsored GALS 2018!